The vocoder is decent, and the quality good. Hopefully the issues can be solved via updates ASAP! Sturdy build and compact. Good overall sound. Decent vocoder and transducer effects. No Chromatic Hardtuning mode. Some tracking issues. Built into a very sturdy metal chassis/housing, the VoiceTone Synth contains quite a few features. Specifically, you've got (deep breath): Hardtune (Auto-Tune-like) pitch correction, coupled with a vocoder; a built in carrier synth (comprising some monophonic/polyphonic presets); a transducer effect to create distortions and megaphone type effects; 10 user-editable presets (a little stingy); and USB for patch backup/transfer/updates. There's plenty of connectivity, including an XLR mic input, instrument jack in (plus a thru-to-amplifier connection to send a clean unprocessed instrument signal to your amp or soundcard) and XLR outputs (though it would be nice to have jack outputs too). This box is squarely aimed at the live or studio performer and has been well thought out in regard to both applications. It's sturdy enough to kick about on stage and straightforward to use. Setting up is a breeze - just plug in a mic, connect your instrument to the jack input, raise the input gain until the average volume is turning the input light orange/green (red for clipping) and fire away. Presets can be selected and stored using the left footswitch while the right footswitch can toggle the Hardtune key (if held) and also acts as an effects bypass. The Hardtune effect works like a preset Auto-Tune and it's pretty usable if you're already an accurate singer, though it sometimes has a problem tracking vocals and more subtle vocal vibrato accurately, even if you're singing the correct notes in the selected scale. We hope this can be improved in a future software revision, as it can be a little bit hit and miss at times. 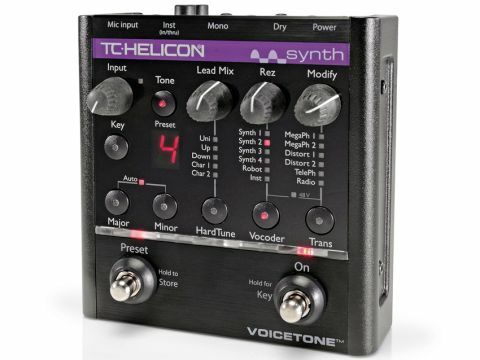 "The VoiceTone Synth is sturdy enough to kick about on stage and straightforward to use." You can use Hardtune in two ways; firstly, by singing without an instrument plugged in, selecting the key, and then selecting major or minor scales using the corresponding buttons. This is easy to do, but a major downside is that there is no internal chromatic mode setting, which is a problem if you like to sing in a more Jazzy/chromatic style and your vocal melody doesn't fit into the included preset scales. Again, we hope this can be sorted via an update but there is one workaround. This involves plugging in a synth or guitar, selecting Auto mode and playing an external instrument to dictate the pitch chromatically. The onboard vocoder sounds great, tracks well and the intelligibility is good with vowel/consonant sounds captured accurately. Also, the four internal synth/carrier tones aren't too bad and can be easily altered using the Rez control/tone button. Feed in a decent external synth, though, and the vocoder truly comes to life. Finally, the Robot vocoder mode and the transducer effects do what they say on the tin too. All in all this is a useful box but it's not without its issues. It's a good vocoder, and the Hardtuning works fairly well (except for the lack of a chromatic mode) while the transducer effects are useful too. However, without an internal chromatic mode and because of its occasional tracking issues, it's currently not quite as happening as we'd hoped.